In accordance with the Ninth Karmapa’s prediction, The Tenth Karmapa, Chöying Dorje, was born in 1604 in Golok, the north-eastern region of Tibet. At the time of his birth, he reportedly took seven steps in each of the cardinal directions. His father Khyethar and mother Atso named him Orgyen Khyab (it was only at the age of forty, upon taking full monastic vows, that he would receive the name Chöying Dorje). He was found and recognised by the Sixth Shamarpa Chökyi Wangchuk, who performed the Black Vajra Crown Ceremony, thus enthroning him as the Tenth Gyalwa Karmapa. He offered the Karmapa the entire Kagyu lineage transmissions and teachings. By the time he was six years old, Chöying Dorje excelled in the arts of painting and sculpture. When he was eighteen years old, he formulated the wish of making a pilgrimage to the sacred sites of the great Kagyu Masters of the past. During that time, most of Tibet was ruled by the King of Tsang, a devote Kagyupa. But aware of the alliance that was being formed between the Gelugpa and the Mongols, the Tenth Karmapa predicted troubled times ahead. 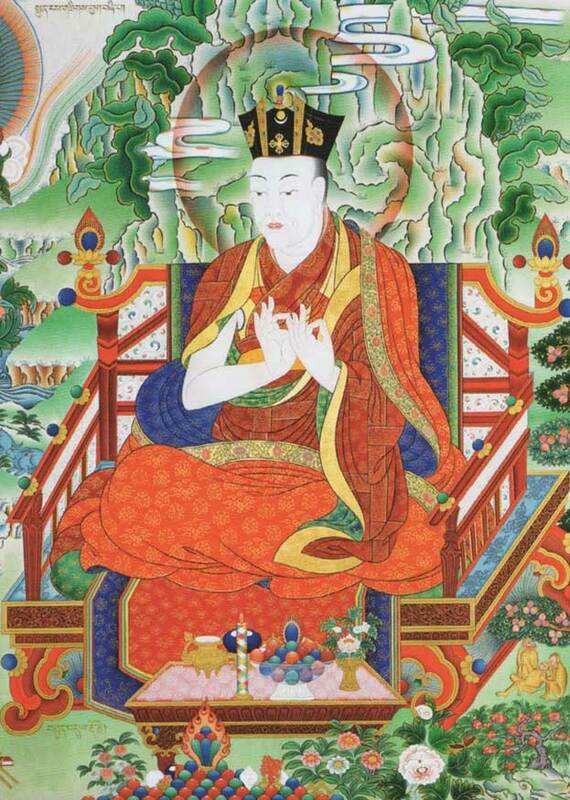 He gave away all his belongings and appointed the Fifth Goshir Gyaltsap, Dragpa Chöyang as his regent. He then left, dressed as a mendicant, in the company of an assistant. In fact, it was recorded that his followers saw Chöying Dorje flying off through space, holding the hand of his chief attendant. They landed in the forests of Bhutan where they spent more than three years roaming the wilds, surviving through the help of animals. As was foreseen by the Karmapa, Gushri Khan’s Mongol armies attacked Shigatse and moved on to cause considerable destruction throughout much of Tibet. They killed the King of Tsang and also overran the Karmapa’s encampment. From Bhutan, the Tenth Karmapa and his attendant travelled to northern Yunnan where its King proposed to invade Tibet and enthrone the Karmapa as its ruler. The Karmapa however refused such an act, considering it unethical. He then visited Nepal. Even though it would take the Karmapa twenty years before he could return to his seat at Tsurphu in Central Tibet, he did return secretly in order to recognise Tulkus. In this way, he recognised the Sixth Tai Situ Rinpoche, the Sixth Gyaltsap Rinpoche, the Fourth and Fifth Pawo Rinpoche, and the Seventh Shamarpa. He also unfailingly gave them the full transmissions and teachings of the Karma Kagyu Practice and Whispering lineages. Wherever he went, the Karmapa bestowed sacred teachings to devoted disciples and established thirteen Karma Kamtsang monasteries. Amongst his many other worthy and close disciples were Karma Chagme, Jatsön Nyingpo and Tsele Natsog Rangdröl. Shamar Yeshe Nyingpo would become his spiritual heir. After leaving a letter predicting his next rebirth, Chöying Dorje passed into Parinirvana in 1674, at the age of seventy-one. The Sixth Goshir Gyaltsap, Norbu Zangpo became regent and temporarily took up the seat at Tsurphu Monastery. © 2019 Drupon Khen Rinpoche Karma Lhabu. All Rights Reserved.